Ooo, shiny new yarn! Actually, most of my yarn is not very shiny since I far prefer wool in all sorts of forms, but the newcomers do make me excited about the projects I have planned for them! This is the public part of my stash right now by the way. And by public, I mean that one of those white boxes to the right holds some projects and less photogenic yarn, and this is what I have on display. No color surprises here! I have my feet planted solidly in the bluish greens, greenish yellows, greys, and browns. First up of my new purchases – Quince&Co Lark yarn, in the color Kittywake. It must have been the dreary day I bought the yarn, but the color looked even stormier then. No matter, it’s still a heathered warm blueish grey color, and I’ve got big plans for it! I’ve been planning another Bayview Street cardigan, but decided to go for a more neutral color this time, so it can pair with all the colors the mustard yellow of the first cardigan is having some trouble with. The yarn seems squishy and springy in the skein, and I’ve been wanting to try some Qince&Co yarn for ages! I also got some Rowan Felted Tweed yarn, in a seafoam kind of color. It was on sale for half off, so I snatched up what was left, with no spesific plans for it. I’m sure I can come up with something eventually. 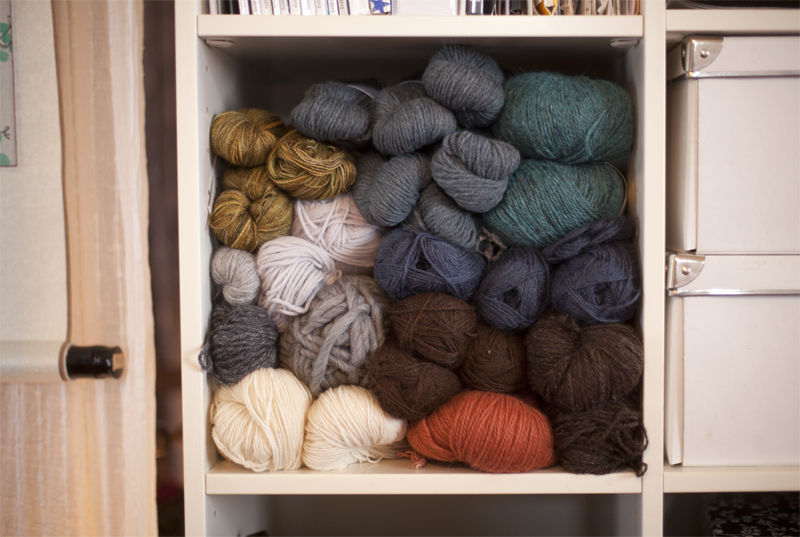 It might be just shy of enough for a proper sweater or cardigan… Perhaps I shall have to hunt down some more? 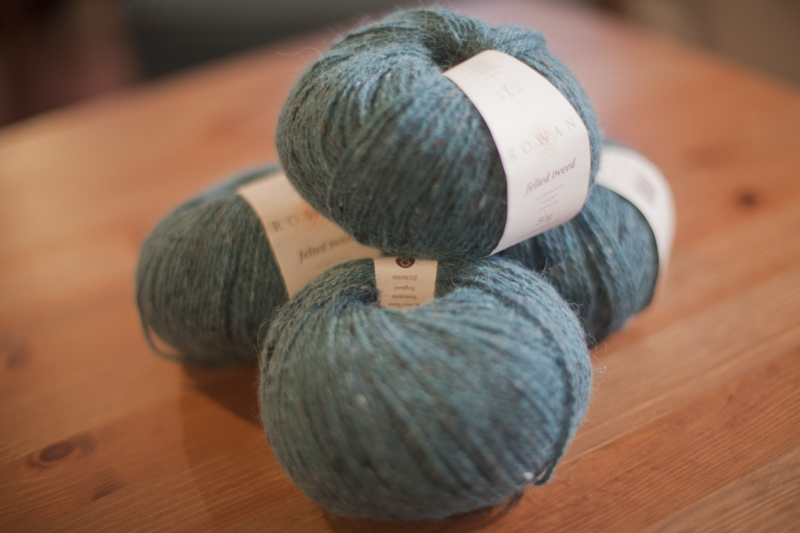 Lastly, some truly gorgeous yarn from Manos del Uruguay! Isn’t that green just crazy pretty? I’m completely in love with it. This is for another one of my Geithust knit lace tops – I’m working on tweaking the pattern to put it up for sale, so of course I have to knit it again to test my changes! Also, the yarn I used the first time was a single ply and a little fuzzy and pilly, so I’m also testing to see if I like this yarn better. After seeing Jen of Grainline Studio’s photo breakdown of her handmade wardrobe, I decided to blatantly copy and do the same, so today I took pictures of a bunch of my handmades. Coming up is a post on that, and my crafting plans for the fall! And yes – DO show your wardrobe! I love seeing other people’s makes all together in one place at one time! Thank you! Hehe.. 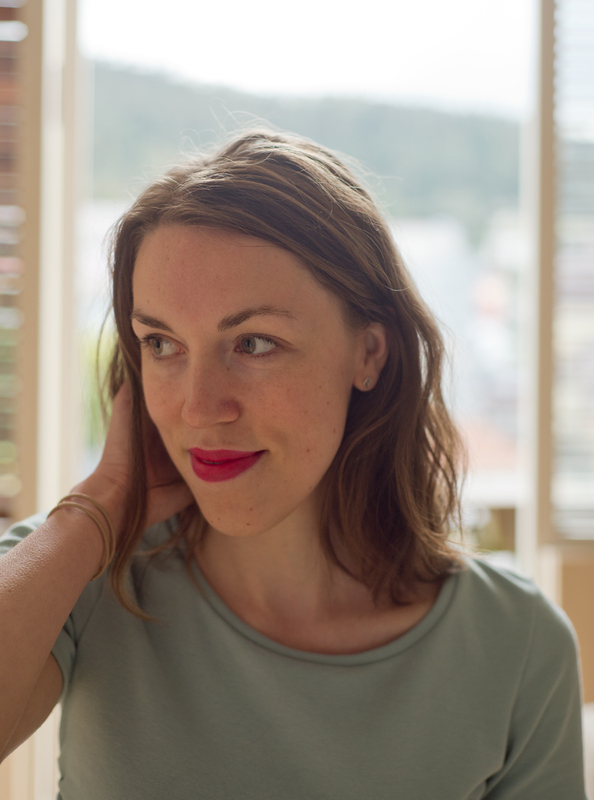 I had to knit pretty much every waking moment (and half awake sometimes too) for a good month – nothing like a booked photoshoot to keep you going! ;) I’ll be sure to make a big announcement when I have it all ready, thanks for your support! I haven’t knit with Quince & Co yarn yet – but I desperately want to. How do you find it to work with? Oh, those yarns look delightful! I’ve been eager to try Quince & Co too and have just acquired some season appropriate (for me) Sparrow (linen). Very envious of all your Autumn/Winter knitting plans, I need to switch to Spring and Summer mode! Man this is some nice yarn! 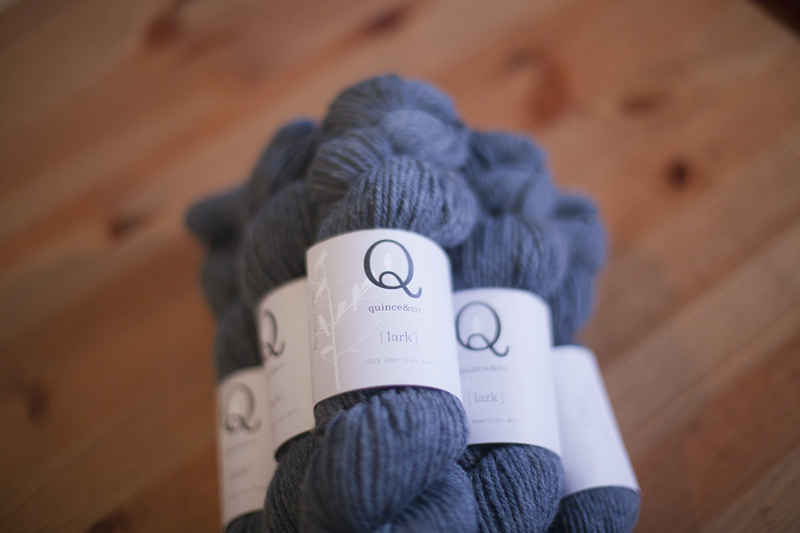 I’ve been wondering about the Quince & Co yarn, it looks so nice on the internet but I’ve never seen it in real life. I’m also pumped to see the lace top, I still can’t believe you designed handknits for your thesis! As far as the wardrobe lineup BRING IT!!! I want to see! Thanks! The Quince & Co yarn is really lovely, and American-made, which of course is a plus (and Maine-based, represent!). Also, they’re setting up a dye factory in Maine now too, so it’s getting even more local! I do like supporting smaller, more local businesses. The price point I think is a little lower than Brooklyntweed, which might have something to do with Brooklyntweed’s yarns being blended from several solid colors, as opposed to dyed to a color, and the fleece is grown/made/husbanded/shorn in the US as well, and I’m not sure Quince & Co does that. Yeah… I get way into yarn production! 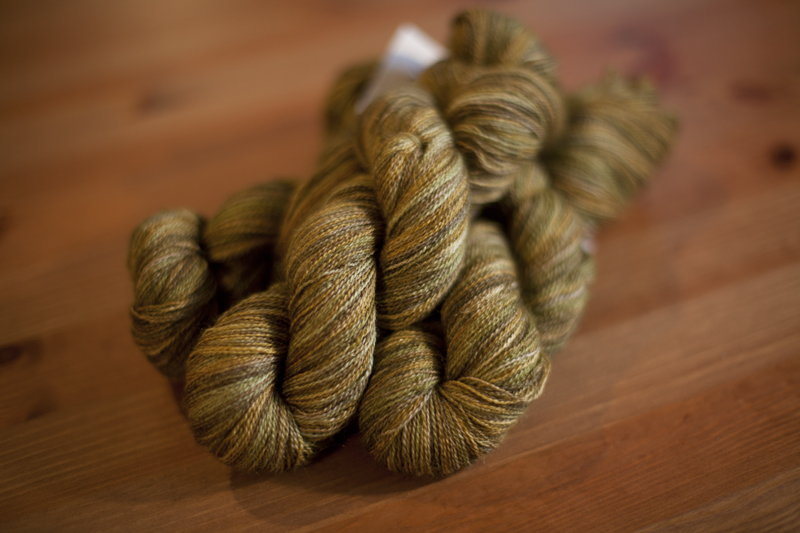 Also p.s., the Brooklyntweed yarn is just delicious – it’s what I used for the green-yellow sweater for the collection. It smelled so good! Nice and tweedy, springy. I haven’t knit with the Quince & Co yarn yet obviously, but I’ve always liked the way it feels. The only thing that has stopped me buying the yarn before is that I prefer my yarns heathered or tweedy, and the Quince & Co yarns are with very few exeptions completely solid in color. I’m excited about the lace top too! The more time that passes, the more I can’t believe I actually did all the work, haha! And then I think I can’t keep going on that work, but of course I can. Bring on the excel spread sheets and calculations!